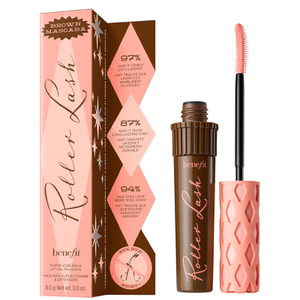 benefit’s newest sensation, the Roller Lash Mascara, is finally here to add some much-needed hook ‘n’ roll to your daily make-up regime! Holding for up to 12 hours, the black mascara will lift, separate and curl your eyelashes and give your eyes a more open and intense look. With a patent-pending, lightweight brush that features a 30-degree curve and tiny hooks on the bristles, you can easily catch every lash. Lashes will appear more voluminous and their length will be increased, whilst the added ingredients of Provitamin B5 and Serin work to condition the hairs. So say goodbye to curlers or falsies and surrender yourself to the super-curling powers of benefit’s Roller Lash Mascara! – N.P. This mascara last 12 hours, don't smudge stay put and lift and curls your lashes, my new favorite mascara. I highly recommend this mascara to anyone who struggles with the lashes pointing down now you can lift up them lashes and curls with the benefit rollerlash. Love this mascara, lashes look long and curled.